Approaching Westview Fuels in the South Harbour. We are a little late starting our summer cruising season, but finally got our Bayliner 2452 in the water at the end of June. 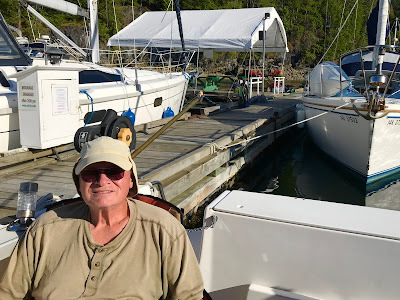 To make sure everything was shipshape, we decided to take a cruise over to nearby Texada Island. First we stopped by Westview Fuels in Powell River's South Harbour to gas up. It's an easy spot to reach with gas, diesel, water and other boating supplies available. Next door to the visitor docks it's handy for locals and guests to the Westview Harbour alike. Looking towards Powell River from the Sturt Bay breakwater. Texada is about half an hour away from our home port in Powell River. It's a fun place to visit. The Texada Boating Club has a visitor's dock (Dock 4 on the outer edge). It's a private private club dock in Sturt Bay, but welcomes guests on a first-come, first-serve basis. When we were there the cost was $.75 a foot with power available for an extra charge, For more information you can contact the wharfingers Bob and Maggie Timms at 604-414-5897 or VHF 66A. 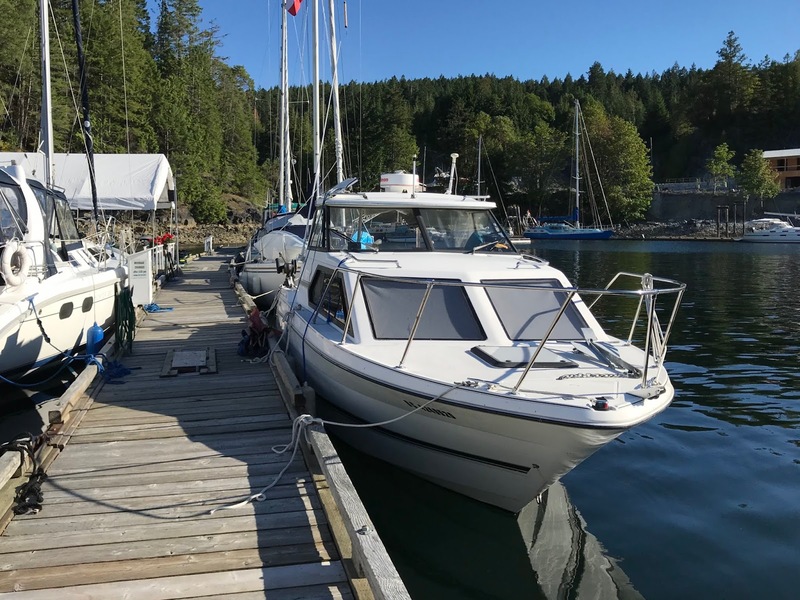 Our Bayliner on the visitor's dock at the Texada Boating Club marina. The marina is within walking distance of the village of Van Anda. 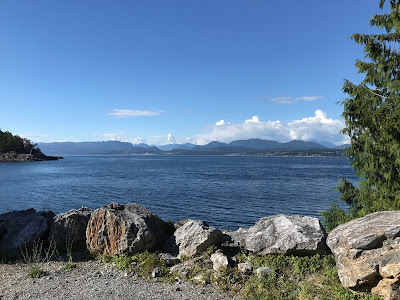 This island community is the largest on Texada Island. It's rural in nature where gardens abound. Forest rings the town so many deer can be seen walking the streets and nibbling yard plantings that aren't protected with tall fences. 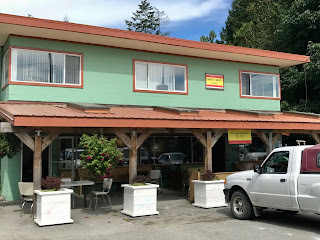 Mary Mary's Cafe in Van Anda on Texada Island. You will find an elementary school, store, museum and several places to eat. The pub and restaurant at the Texada Island Inn (Gillies Bay Road) have reopened. Rooms for overnight stays may become available by 2019. We walked up the hill for a nice dinner. The next morning we walked over to the Mary Mary's Cafe (1989 Marble Bay Road) for breakfast with the locals. That made for an easy overnighter without meal preparation. Historically, Van Anda was a much larger thriving mining community. Today, mining is still a major part of the economy, but the town has become much smaller and relaxed. You can read about it in Heather Harbord's book Texada Tapestry: A History. Wayne relaxing on the back deck on a warm sunny day. If you don't have a boat of your own, you can still visit Texada Island. Driving by car you can take the ferry from Powell River and explore the island at your leisure. You can also reach Texada by air using scheduled KD Air flights or your own aircraft. Please note there is no public transportation on Texada once you are there. You can read more about cruising Coastal BC and the Strait of Georgia in Wayne's nautical themed books Up the Strait, Farther Up the Strait and Up the Inlet. Available Online: "Up the Strait"